It was, by and large, a risk-on day with good news coming out of the US, Europe and China. It was reported that the number of Americans applying for jobless benefits was at its lowest for more than five years. The result was that US crude prices snapped a string of three consecutive declines, recovering $1.35 to finish at $105.17. The feel good factor surrounding the big global economies has easily spilled over into the precious metals market. Rallies in equities have driven gold $9.9 higher to $1376.5, having said that, $1400 remains elusive. The US Department of Energy released its weekly stockpiles report yesterday, which showed a fall in supplies by 1.4 million barrels, largely in line with the average consensus. Nonetheless, the energy complex paid closer attention to the minutes of the Fed's July meeting and seemingly interpreted them as supportive for tapering sooner rather than later. Consequently, the crude oil futures plunged $1.31 to end at $103.81. Increased speculation that a reduction of stimulus could start as early as next month undoubtedly does not bode well for gold prices. As such, investors would have less need to look for a safe haven, delivering further blows to an already out of fashion precious metal, which yesterday fell $4.5 to $1,366.9. The energy sector became a tad uneasy about the Fed's next move, with the prospect of a reduction in the stimulus now a growing possibility. As such, Nymex crude oil continued to decline, finishing $1.56 lower at $105.12. Meanwhile, the reopening of oil terminals in Libya, which had been closed because of social unrest, was also a bearish influence. Gold prices rebounded $6.0 to $1,371.4 on the back of increased demand for safe haven assets ahead of the FOMC minutes release. At the same time, a weaker dollar also spurred some precious metal buying. 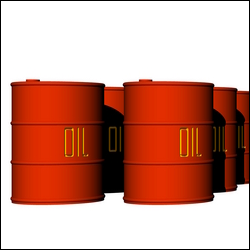 WTI crude oil snapped a string of seven gains in a row as the threat of a storm in the Gulf of Mexico receded. Seeing less need for a weather premium, spread betting investors pushed WTI down to $106.70 per barrel, a fall of $0.84 for the day. At the same time, the demand for gasoline from US motorists is expected to slow down as the peak usage of the driving season has passed. Just when gold seemed to be in the mood to test the $1,400 level, buyers got cold feet and took profits off table. As a result, the precious metal pulled back, losing $13.7 to $1,365.7, with pressure being added by growing speculation that the Fed might start reducing the pace of the monetary stimulus. As the social conflict in Egypt continues to escalate, WTI crude prices maintained their steady climb, gaining $0.46 to $107.46 a barrel. In addition, oil prices have been supported by reports of a potential tropical cyclone in the Gulf of Mexico which threatens to disrupt supplies. The significant drop in gold prices observed since the beginning of the year has undoubtedly started to attract plenty of physical buyers. Moreover, tensions in the Middle East and North Africa are getting worse, spurring demand for a hedge against tumultuous situations. As a result, the precious metal seems to be trying to break on the upside, rising $7.0 to $1,373.4. WTI crude oil settled up $0.50 at $107.30 a barrel yesterday, as continuing woes in Egypt and declining US stockpiles provided the support. In addition, the energy market received a boost from figures suggesting that the number of Americans applying for jobless benefits fell to its lowest level since the economic turmoil started in 2008. More people in work and an improvement in the economy is generally a good pre-cursor for future demand. Gold is very much benefiting from the quick falls in equities seen over the last two sessions. The metal rose by 2% yesterday and is near a two month high at $1,363. Gold started off trading sharply lower but staged a rally as the stock markets started to tumble. Of course, the rally was only accelerated by the simultaneous fall of the dollar. West Texas Intermediate rose for a fifth day on the back of increasing violence in the Middle East. Egypt has declared a state of national emergency as hundreds were killed when security forces tried to break up the sit-ins being staged by protestors. Further west, US stockpiles have declined for the second week, further supporting prices. As a result, WTI crude gained $0.50 to close at $107.33 a barrel. The rally in gold continues and the precious metal is now at its highest level for three weeks. Not only has physical and investment demand increased, but the US currency has weakened, adding value to dollar denominated investments. West Texas Intermediate had a topsy-turvy day of trading but ended up gaining $0.70 to settle at $106.83 a barrel. Unrest in the Middle East was responsible for the gain, particularly in Libya, where the strife has forced oil output to be at its lowest level since the 2011 civil war. Gold fell for the first time in a week yesterday as positive signs for the US economy boosted speculation about a reduction in monetary stimulus. In addition, the small rally in the dollar decreased the appeal of the precious metal and so gold futures for December delivery fell by 1% to settle at $1,320.50. Amid speculation that US crude stockpiles fell for the sixth time in seven weeks, West Texas Intermediate traded near its highest price for a week. Having said that the move was small and it was relatively unchanged on the day, closing at $106.20. Much like many other assets classes, oil CFDs will largely look at next month's Federal Reserve meeting. Surging demand for the precious metal in China provided the impetus for the continuing rally in the price of gold. There has been a reported 54% increase in demand for the first half of the year from the world's second biggest consumer of the precious metal. Gold rose 1.7% to close at $1,334.20. An increased appetite for growth based assets fuelled the strong move in the energy markets on Friday. Reducing concerns of a slowdown in China, the world's second largest economy, was the reason for the hike in price as it broadcast strong industrial output numbers for July at 9.7%. As a result, the crude oil spread betting market moved more than $2 higher to close at $106.05. Gold futures had a very quiet day on Friday, in an un-volatile and directionless session. The contract for December delivery closed up 0.09% at $1,311.10. This morning, things are looking up for the precious metal as it trades $17 higher on news that holdings of the world's largest gold ETF are on the up again.